The works of William Shakespeare have been an enduring challenge for film makers, providing ready-made scripts packed with drama, action and melancholy, all rendered in enchanting language. It was an eventuality that Shakespeare was to be translated into other languages, and also begin to appear in non-English films. Some of these have tried to make a more dedicated effort to preserve Shakespeare's wonderful verses - other's have simply taken the story - often into another time and place than the original setting. Revered Japanese director Akira Kurosawa, affectionately called "Tenno" (Emperor) by his associates, took on the Shakespeare Challenge, and with stunning results. 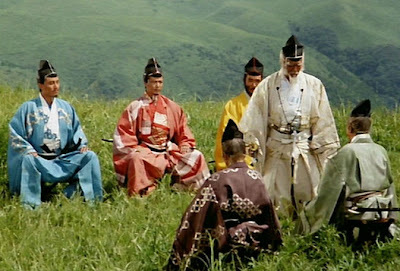 Two of the most breathtaking examples of Shakespeare reimagined are Akira Kurosawa's Ran and Throne of Blood. 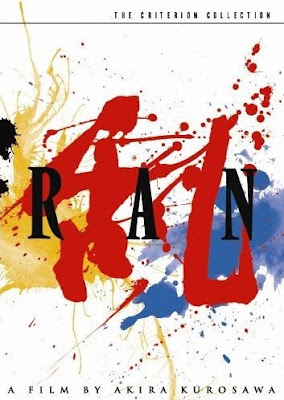 Ran was an adaptation of King Lear - and was one of Kurosawa's later projects - stunningly filmed in colour - with an epic scope rendered possible by the financial backing of Kurosawa devotees and Hollywood Champions George Lucas and Francis Ford Coppola. Throne of Blood is filmed in black and white, and features striking performances and visuals. Based on Shakespeare's Macbeth it is an unforgettable film, both for its storytelling and acting. 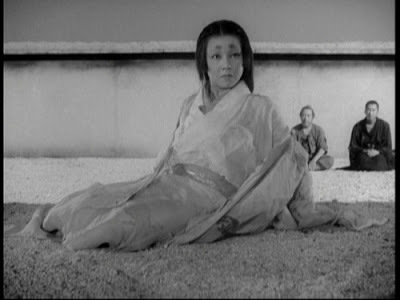 Toshiro Mifune plays the doomed Captain Washizu, and Isuzu Yamada is a chilling Lady Asaji - as good an interpretation of Lady Macbeth as you will see in any Royal Shakespeare Company performance. Both of these films are set in Medieval Japan, the times of great Clans, Castles and Samurai - which is not too far a departure from the Kings and Courts of England or Scotland. No attempt has been made to directly translate Shakespearian language - instead dialogue, even gestures are performed in very stylised manner, derived from Traditonal Japanese Nogaku (Noh) and Kyogen theatre. Macbeth itself has a strong supernatural element, with the Three Witches who fortel Macbeth's unfortunate destiny. This transposes nicely to the Japanese setting, whose culture is equally replete with meddlesome demons and evil spirits influencing the lives of men and women. One of the more eerie scenes in Throne of Blood is when Captains Washizu and Miki become lost in 'Cobweb Forest.' Beset by evil spirits, they attempt to charge through it on horseback, firing arrows into the sky to keep the spirits at bay. They eventually come to a clearing, and find a spectral figure in a hut, spinning thread onto a wheel. It outlines the fates of the Captains, and sets the course of the tragedy that is to follow. The image of the Spirit spinning the thread has become iconic in Japanese film and TV, often appearing in a depiction of an evil spirit or seer in period dramas. The Spinning Wheel is a delightful visual metaphor for Time - as the Spirit describes what is to come, bringing together the strands of all event that have led up to that moment of prophecy. Receive life in this world? Spirits are not an uncommon element of Kurosawa's work. 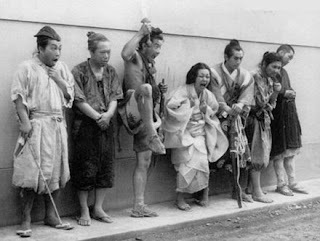 An earlier film, Rashomon has a unique scene where a spirit medium is used to give the testimony of a dead Samurai in a murder trial. 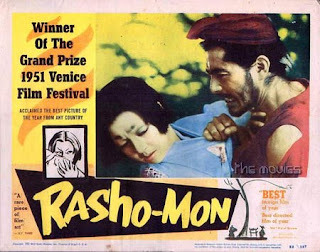 Rashomon consistently makes critics' "Top 50 films" of all time, and features dazzling performance by Toshiro Mifune as outlaw Tajomaru and the cute and cunning Machiko Kyo as Masako. It is based on the fusion of two stories by Japanese writer Ryunosuke Akutagawa . Rashomon can be read here - it was Akutagawa's first published short story and provides some elements of the film, but it is his other (very) short story In a grove which makes for the guts of the film - it is a quick read and can be viewed here. During the course of the trial, the testimony of each witness reveals shocking differences, outlining the motivations of each character. One of the testimonies presented put the cause of the murder as a gust of wind,where it was described that the bandit Tajomaru became entranced by Masako after a breeze revealed her face from behind a veil. "Were it not for that breeze....I would not have killed him"
The testimony of the Spirit Medium is my favourite - allowing the spirit of the murdered man to speak through her. It is quite creepy and also reminiscent of Noh Theatre which itself is often set in the spirit world. It is also worth noting that Japanese cultural organisations have been feverishly working to restore Rashomon to as pristine a state as possible. Ran, whilst also a tragedy, takes a different tact to Macbeth, as does King Lear. There is less of a supernatural element, and instead the folly of Human Nature becomes the driving force that lead the characters to ruin. The role of Lord Hidetora Ichimonji is played by Tatsuya Nakadai - who puts in a superlative performance as the deluded sovereign. His companion and Jester is one of the true stars, readily aware of the Kings foibles, yet loyal nonetheless. The story revolves around the King and his sons, who are named after and depicted with colour as metaphor. Most of Kurosawa filmography has been released on DVD by The Criterion Collection and are available from specialist distributors, including amazon. Bluray editions are imminent, having been released in Japan in 2009. 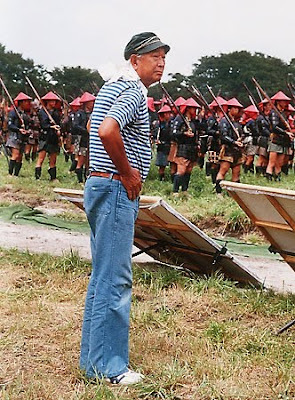 Akira Kurosawa has since become a cultural icon for his contribution to film in Japan and his influence in Hollywood. After the immense successes of Rashomon, Seven Samurai (1954) and the Sanjuro films, from 1965 Kurosawa entered a negative phase that saw many failed projects. The negative reviews originally garnered for the film Dodesukaden (1970) led Kurosawa to attempt suicide. These early reviews were immensely short sighted and this film now ranks among of Kurosawa's (relatively) hidden gems. For those interested in learning more about Kurosawa, a free documentary is available for viewing or download at this link. It is a pleasantly watchable summary of Kurosawa's life and works, including commentary from key Hollwyood figures whom derived inspiration from his work. There are several books which examine Kurosawa and his works, including an upcoming 2010 title - Akira Kurosawa: Master of Cinema written by Peter Cowie with a foreword by Martin Scorsese. However, no Kurosawa journey is complete without reading The Emperor and the Wolf by Stuart Galbrath IV, which examines the intertwined careers of Kurosawa and Toshiro Mifune. 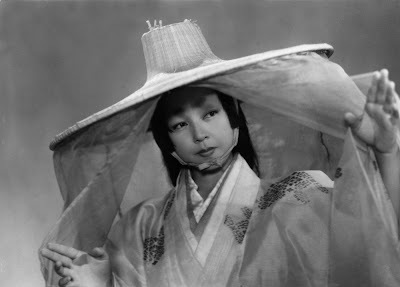 If you've enjoyed this article and haven't seen a Kurosawa film yet.... do so! Any of the films outlined in this article are great places to start. To the sorrow of film goers world wide, Akira Kurosawa passed away in 1998, aged 88 - fortunately his legacy and significant body of works will give him perpetual reverence in the Cultural History of Japan, and International Cinema. Just looked at your post on Kurosawa. I am also a big fan. I just showed Kurosawa's "Dersu Uzala," at our local Foreign Film Fest and everyone loved it. You ought to revisit it. The DVD version preserves the stunning photography, and the storm scene is fantastic. Just a correction, Sergio Leone's "Fistful of Dollars" was NOT a Hollywood movie. It was a spaghetti western. Hollywood had nothing to do with Sergio Leone movies. Good point! I've tweaked that to describe "western film makers" not Hollywood per se :) I recall reading Leone used to watch Yojimbo while developing the script for "Fistful" - it turned out nicely for Kurosawa, who made more from his successful copyright claim against the movie than he ever did for Yojimbo.